Orange County, California has often been dismissed as a dead zone for music and other expressive cultural forms. This goes for mainstream, alternative, underground, Asian American, etc. Stereotyped as bland suburbia relative to its hipper, edgier northern neighbor (I’m talking about Los Angeles for those geographically-challenged readers), OC hardly makes it on anyone’s radar for an evening of culture and entertainment, unless you are of the retired set. In fact, not too long ago, I was assured by colleagues at Cal State Fullerton that a hip music scene can be experienced with a quick Amtrak ride up to LA. What about OC, I asked? Oh, um, well, there are some nice museums, the beaches are great…and a bunch of other compensatory examples of the stereotypical laid-back beach-bumming lifestyle of OC devoid of any real arts or culture to appeal to the youthful masses. Perhaps we need to give OC a chance. I hope to dispel some of these entrenched ideas about the music and arts scene in OC, especially as it pertains to Asian American communities. I have recently relocated to OC and have been attending community arts events this past month that certainly inspire optimism for the direction of arts and culture in this diverse suburbia. The two events I discuss below are part of two new series featuring musicians, poets, visual, spoken word, and other performance artists right here in Orange County. 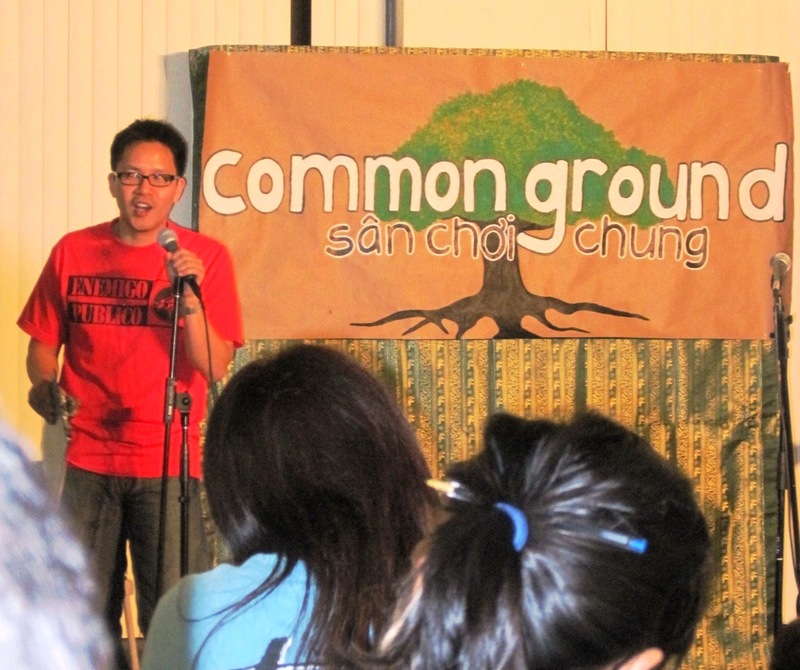 They are common ground/sân chơi chung, an open mic venue for artists of every stripe to showcase their skills and network with each other and the Tony T Sessions, a concert series featuring up-and-coming musicians and singer-songwriters. If these venues continue to flourish and provoke similar movements, OC can certainly live up to its potential as fertile ground for artistic expression. 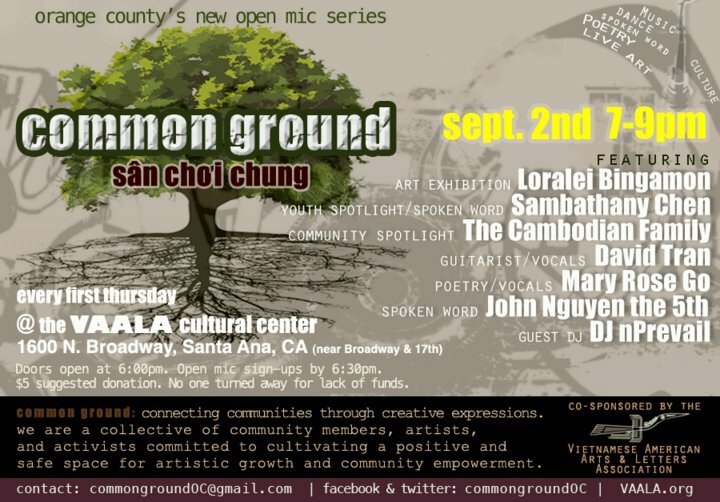 The first common ground open mic was launched on August 5 with the theme “empowered women (re)defining the arts.” Over a hundred people gathered in the new Vietnamese American Arts and Letters Association’s (VAALA) cultural center to hear featured artists such as Mai Doan, a poet/writer from San Francisco and Jumakae, a hip-hop artist/singer/songwriter who hails from Long Beach. The vibe was energetic and youthful, with performers as young as high-school age taking the microphone to inspire the audience with their passion. Local groups such as Project MotiVATe were represented among the performances and attendees. One of the crowd pleasers of the evening was a spoken word poem by Anna Minh-Giang Nguyễn from San Jose who defied social perceptions of her “mediocre breasts” and traced a genealogy of female strength through them. Tapping into the success of the first open mic, common ground returned on September 2 with yet another provocative theme, “home.” The event appeared to be as well attended as the first, if not more. I was pleasantly surprised to see many new faces mingled with last month’s crowd. This series has noticeably generated a buzz in OC. Opening the evening was a first-time reading by Leslie Chanthaphasouk, a Lao-American UCLA grad (former student of mine) who gave a thoughtful historical rendering of her grandfather’s lasting legacy. This time the feature line-up included artists such as Tuesday Night Café’s Mary Rose Go, quirky-cool guitarist/songwriter David “Applesauce” Trần, and art exhibition by Loralei Bingamon. Mary’s powerful voice projected a haunting song in Tagalog about women of the Philippines and diaspora. Applesauce was as saucy as ever and gave in to the crowd’s request to perform his “Fox News” song to the delight and choral accompaniment of the crowd. Other spontaneous sign-ups proved to be just as enjoyable as the features, with a performance by singer-songwriter Giana Nguyễn, whose original song, according to my friend Christine, gave her shivers. Tony T Nguyễn of the Tony T Sessions was also present and belted out his song, “To Be Free” while jamming on the piano. Another pleasant surprise of the evening was representation from the hit film soon-to-be released in the US, Để Mai Tính/Fool for Love. Director Charlie Nguyễn and lead actress Kathy Uyên announced their film and asked for support, especially from the younger generation. Check back on our blog for reviews of the film by our diacritics across the US! 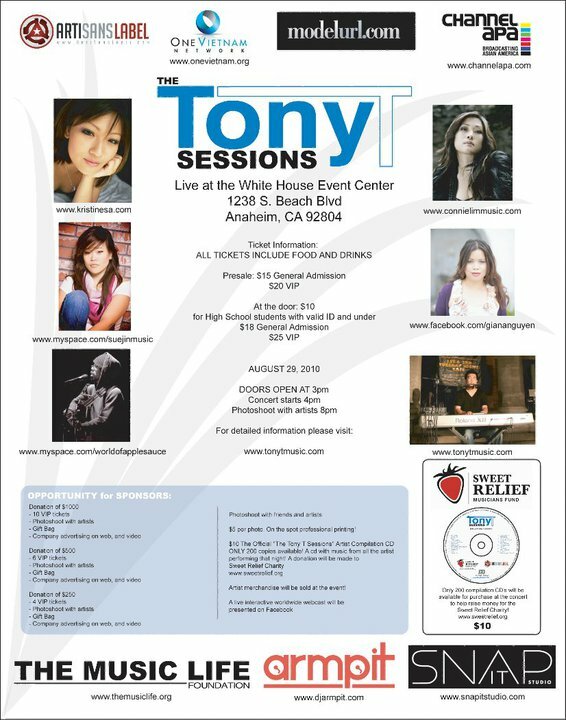 The second event I attended this past month in OC was the Tony T Sessions, a concert series featuring local musicians, songwriters, and singers. The first session in the series was performed live on August 29th at the White House Event Center in Anaheim. Cocktail tables and plush sofas lining the walls leant a hip, lounge-y ambiance to the concert and no doubt inspired the intimacy between performers and the audience. However, it was also webcasted live and allowed those without the means, the time, or the ability to virtually attend. In attendance at the White House were reps from Channel APA, SBTN, and One Vietnam Network, a social networking site for Vietnamese and diasporics recently launched. I was among the fortunate crowd who experienced the White House venue and it proved to be a thoroughly enjoyable evening of music and musing. The six Asian American artists featured were David “Applesauce” Trần, Giana Nguyễn, Connie Lim, Sue Jin Kim, Kristine Sa, and Tony T. Their musical styles and strengths varied but they had one very important thing in common—their passion for music. This might be a great pathway to breaking the humdrum formula of Paris by Night-style recycling as these artists all performed their original pieces and all could play one or more instrument. I appreciated how their unique talents were featured at the concert, which provides a different way to entertain from the cookie-cutter numbers on PBN and Asia, to name the two most prominent Vietnamese American production companies. What’s more, these artists really demonstrated the power of collaborations that reached beyond lines of ethnicity. Out of this collaboration came a compilation CD funded by ArtiSans Label, and all sales proceeds went to a charity foundation called Sweet Relief, which aids musicians who are disabled or ill. Food for the soul through music and charity! I am now convinced that there’s plenty more to come in the arts scene in OC, whether you are looking for a space that feels very community-oriented or more lounge-y and urban…stay tuned!